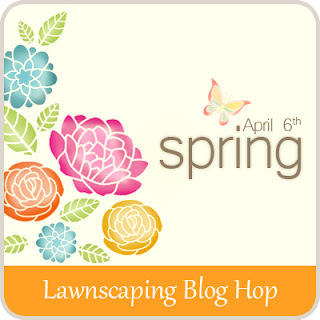 Welcome hoppers, to this fabulous Lawnscaping Spring Hop. You should be arriving from Danielles blog. I am so excited to be a part of this Lawnscaping hop. 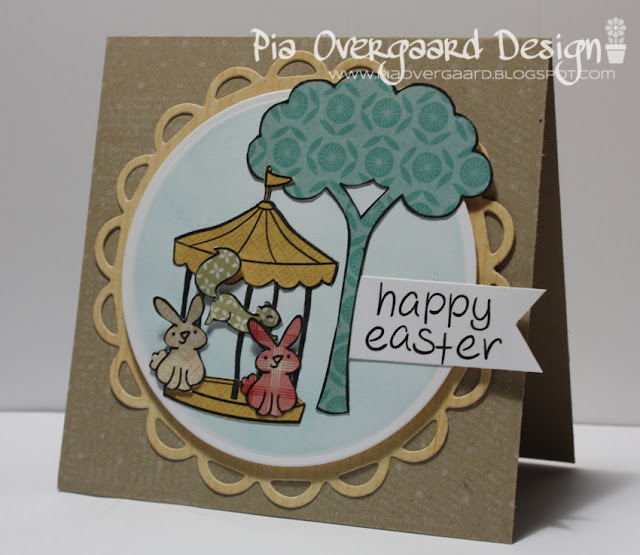 It is about Spring and I am sure you have seen some fab cards on your way so far. The hop runs from Friday, April 6th - Sunday, April 8th! You have the whole weekend to hop along, so be sure to check out all the blogs and leave a comment to win some fabulous prizes. The generous SPONSORS are: Lawn Fawn and The Sweet Stamp Shop Stamp. Further prizes include a May Arts Ribbon prize pack, a prize from Cards Magazine AND an American Crafts Glitter Tape prize pack (newly released). Here is my spring card for you today! I have used the Critters in the burbs & the Admit One to create a carnival scene under the tree - love those bunnies. The happy easter saying was created using Jessies ABC. I used various pattern papers from Cosmo Cricket and My Minds Eye to paper piece the scene. The dies are from Spellbinders. The background is stamped with subtle white (hero arts raindrop background & newspaper background). Next head on to Pam's blog . If you've gotten off track, don't worry! Head on back to Lawnscaping to see the complete list of the hop participants and prize information! Oh wow, this is super fun! Love it! I just love everything about this card!!! The subtle background really pulls it all together for quite a lovely card!!!! TFS! Adorable card... love the color combo and the cute scene you created! Very pretty! Awww, this is so cute Pia! Love all the paper piecing against the kraft! Fantastic! Pretty card. Great paper piecing! Such cute little animals and a cute card. 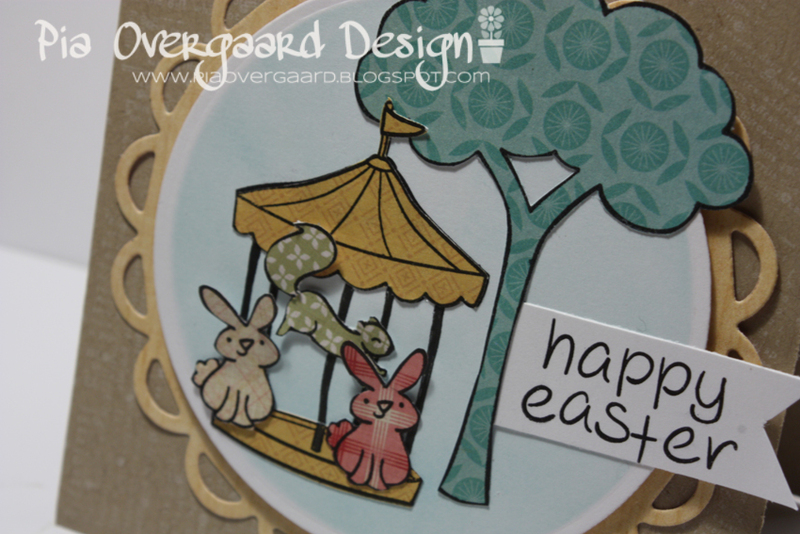 beautiful card, so cute, the carousel is just so cute! Fun carousel! What a happy spring scene. So fun! Great paperpiecing and clever idea, this is so cute! Great idea! I love this card-especially that squirrel! Can I borrow your creative brain for a while? ;) Love this card, so fun! Oh so cute! Love the piecing, and my favorite thing about this is that squirrel. Just love how he's placed! Love your paper pieced critters. I love the Easter carousel you created here. Very cute! We met again! Great little card! A gazebo! Great idea. And caaayute! LOVE LOVE the bunnies and the paper you chose for them! What a fabulously cute card! Loving the paper you chose for all your animals. My favorite is the squirrel. Very cute card. Thanks for sharing. i love how you used the merry go round as a gazebo! Love the paper piecing and the merry go round. How did you cut out the figures in the merry go round stamp? Thanks for sharing! What a fun card! Your design is terrific! Very cute little scene--I like your paper piecing. This is just darling! I, too, love the bunnies! Wow, so cute! Love your paper piecing! Very beautiful card. So elegant!!! I like taht SQUIRREL jumping in there! 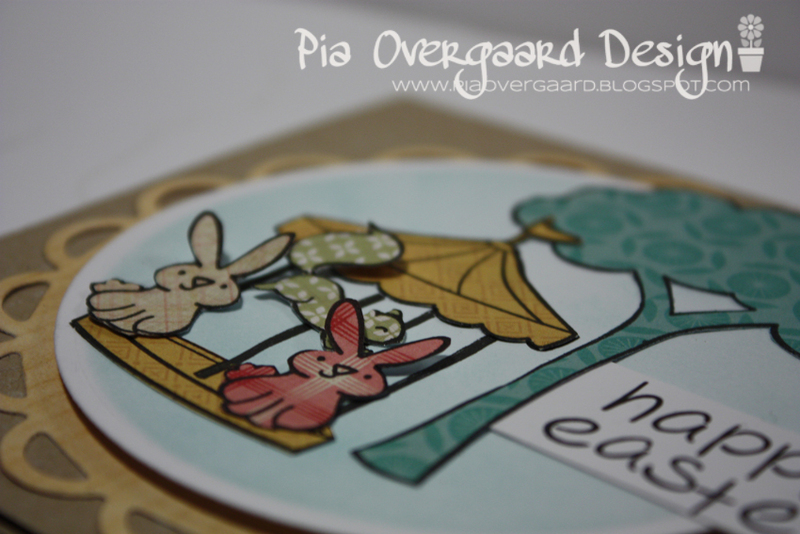 Pia, your card is awesome! Love the carousel scene. Cute! Love! So pretty, all of it, just pretty! Love the color palette, love the dimension, the critters! So sweet...love how you reworked the carousel. You always bring out some amazing creativity, Pia! You created a really cute Spring scene. Great Job! I love this card! So fun and colorful! Great card, I love the colours you have used. How adorable! What a great mix of Lawn Fawn stamps. This is so cute! I love all of the patterned papers you used!! Omg so cute love the scene that you created!!!!!! This is such a cute scene, love the paperpiecing! Your card gave me a big smile. Thanks a lot for the inspiration. First time I see paper piercing with these stamps. Great idea! Aww so cute!! I love how you used the carousel as a gazebo! Great idea! love your stamping on patterned paper, I never think to do this but it's so cute! Fun card. The carousel with the animals is adorable. What a sweet card, so cute. Cute! Great paper piecing and lovely design!